There's nothing more annoying than being out for the day and realising your phone is about to run out of charge, especially if you're on a train and can't get one of the table seats with the plug points (speaking from experience of forever being caught out with this!) The portable charger from Anker is just £10.99 and can add over 1x charge to an iPhone 6. It's also compatible with iPads and the new 12" MacBook. It'd be great for commuters who regularly suffer from battery woes. You can never have too many scarves (that's what I tell myself anyway when buying yet another to add to my already overflowing scarf drawer!) 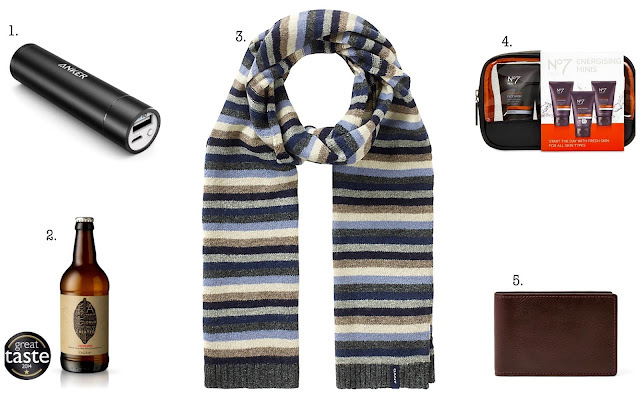 and this Lambswool striped Scarf by Gant would suit all ages and be great for keeping warm and looking stylish during the colder months. I think everyone needs a pair of socks at Christmas. These fairisle print socks from Next are subtle enough to be worn all year round (although who doesn't sometimes find themselves ending up wearing a pair of festive socks in July when all the other pairs are in the wash) The Body Shop stock a great range of products for men and have lots of reasonably priced gift sets on offer. The 'Modern Gents Shaving Kit' contains their bestselling Maca Root Shave Cream which conditions and moisturises the skin leaving a silky smooth finish. The explorer bag would make a great weekend bag if you're buying for someone who always seems to be on the go. It's roomy enough to hold all your essentials whilst still being compact enough for your travels. 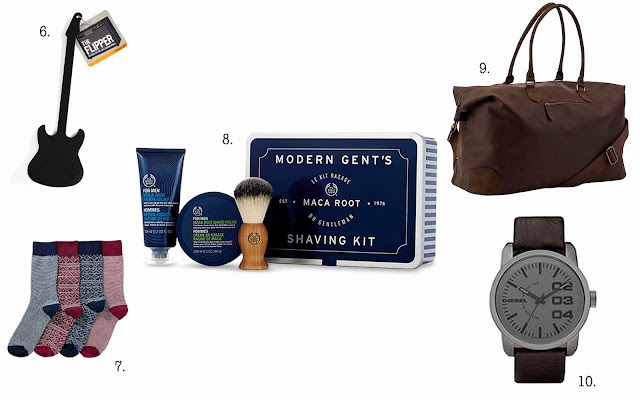 I hadn't seen a men's style beauty box until I came across the AW15 grooming box at Selfridges. It contains 9 luxury products from brands including Clarins Men and Molton Brown and comes with an Otis Batterbee zipped bag to store them in. This would make a great gift as they could try out the products and then you could repurchase their favourites (saving you deliberating over what to buy them next year!) 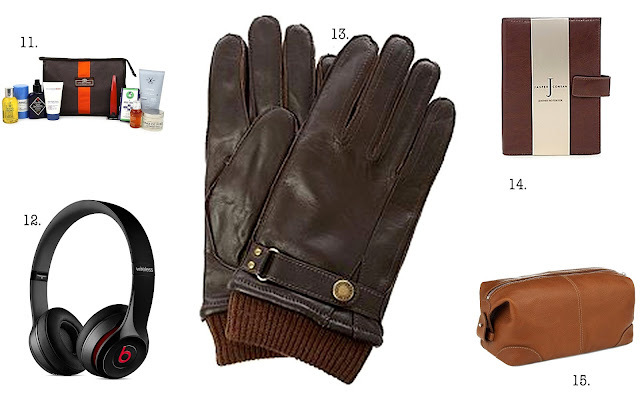 You can't go too far wrong with a classic pair of leather gloves. Dents have lots of great styles to pick from including this brown pair with the cuff detail. What have you been buying as gifts this year?